The story of Trail’s End Beef reads like the script for a reality television show. First, there’s a female protagonist — city-raised, private-school educated, a show jumper with an MA in history, a book author. She’s tall, lanky, blonde, engaging, a go-getter. Vegetarian. Then, there’s the male lead, also tall, also lanky. Raised on a mixed farm in west central Saskatchewan, soft-spoken, a handyman. Formerly an International Agriculture exchange worker, now a cowboy for hire. And, of course, they link up, deciding that the ranching life is for them. Then, the real interest grows as they pioneer their own 21st century version of cattle ranching. 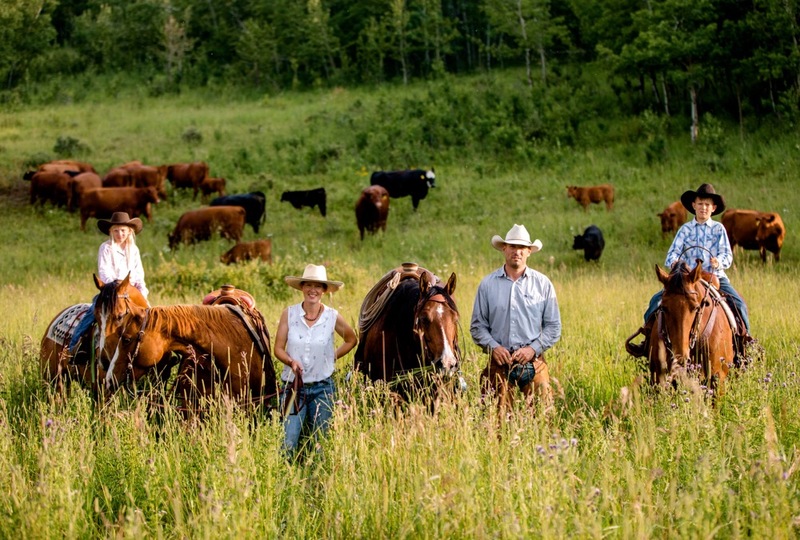 So let’s introduce Tyler and Rachel Herbert, the proprietors of Trail’s End Beef. 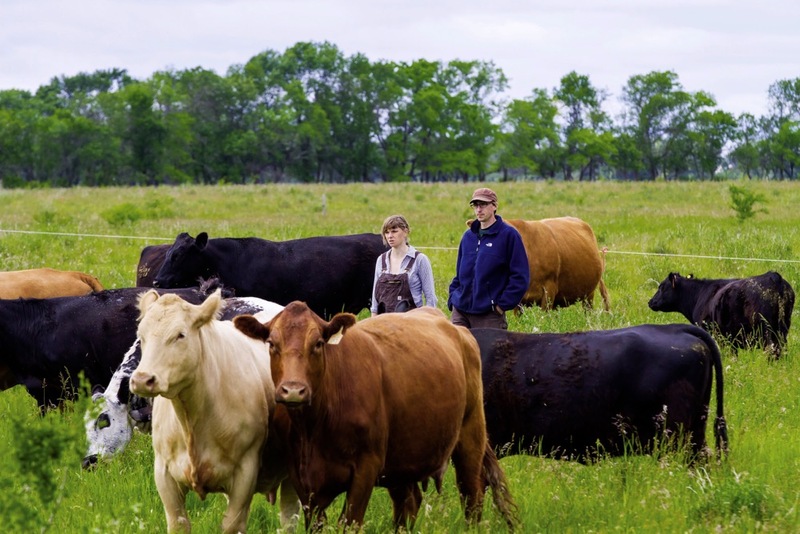 From their farm on the outskirts of Parkland, right in the middle of Alberta’s famous ranching country, they sell grass-fed beef to their clientele an hour north in the city of Calgary (population 1.4 million and growing) and the surrounding area. The day Country Guide arrived for the interview, moody, rumbling skies threatened a much-needed rain, (except for the hay crop just swathed on Rachel’s uncle’s farm north of Nanton), and it was like the TV show was still on. I found Rachel taking some cuttings from her perennial bed on the west side of the house, when Tyler joined us in the yard after capturing their horses. They tell me that after our interview the next job on their list is to gather some two-plus year old steers and get them ready to go to the abattoir. But, like all plot lines, there’s more background to this story. While Rachel grew up in the city of Calgary and was educated at the Waldorf School where holistic learning is emphasized, her ancestral roots in southern Alberta’s ranching community run deep. People genuinely didn’t know what grass-fed was,” Rachel Herbert says, explaining why customer outreach is key to their success. Her mother was the granddaughter of Fred and Edith Ings. Fred started the OH Ranch in the rich grasslands of the Porcupine Hills in the late 1880s, which makes Rachel a fourth-generation Albertan. The land where the Trail’s End cows now summer and where they grow lush and fat on some of the best native grass in the world, was where Rachel spent her summers growing up. Her late mother came into the land about 15 years ago, about the same time Rachel and Tyler met when he was working as a cowboy for a local outfit. With that land as a base, and a few of her mother’s cows and Tyler’s yearlings, the young couple ventured into the cattle business. “We recognize that what we are doing is cattle ranching; we aren’t raising our cows and calves any differently, but the yearling and finished-beef cattle are definitely outside the norm,” Rachel says over a cup of strong, black tea in their tidy, homey country kitchen, complete with an authentic Hoosier cupboard. It was her mother Linda Loree who discovered the American grass-fed niche, and Tyler immediately recognized the value and the fit for the small scale of their operation. And they’ve made it grow. Their first year, they slaughtered four head. Now, 15 years later, they slaughter 60 head of their own cattle. Despite the storybook plot, it’s their strong business plan — meticulously nurtured and executed with hard work — that is the key to Trail’s End success. 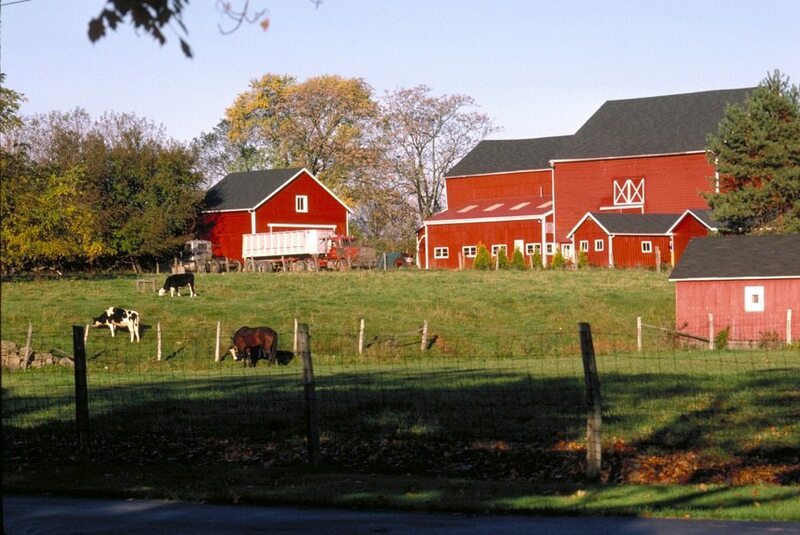 The decision to raise grass-fed beef is the obvious difference from the cattle business norm. 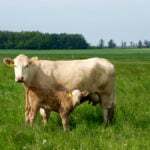 However the Herberts also invest more time and resources into their herd by growing their calves to 24 to 28 months of age before they are sent to market, a full year later than grain-fed cattle are slaughtered. Their deliberate strategy allowed the Herberts to take advantage of the genetics of their small-framed, easy-keeping Red and Black Angus-based herd and the ample grass available to grow their calves. At least in the beginning, Rachel says they needed to help their customers understand the difference between grass-fed and grain-fed beef. “When we began, we were really educating people about grass-fed meat. 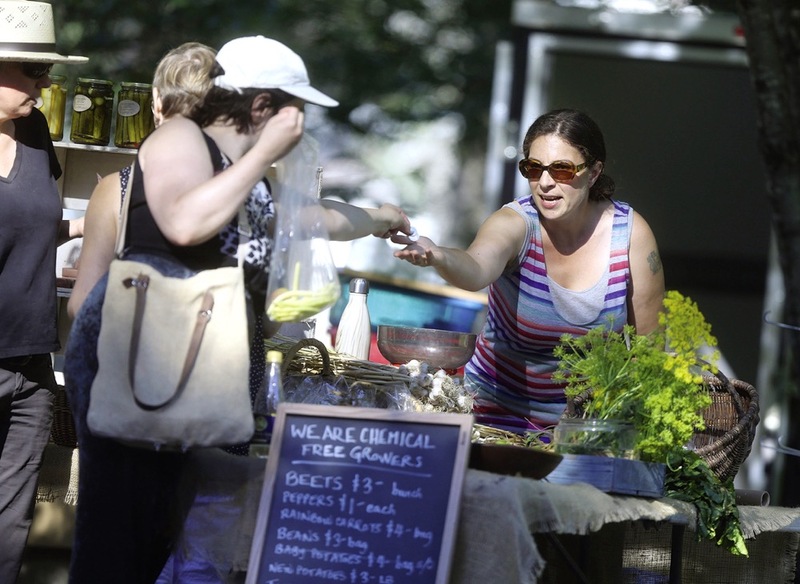 People genuinely didn’t know what was grass-fed was,” she says. The couple would, for example, attend an Earth Day or Christmas market just to network. 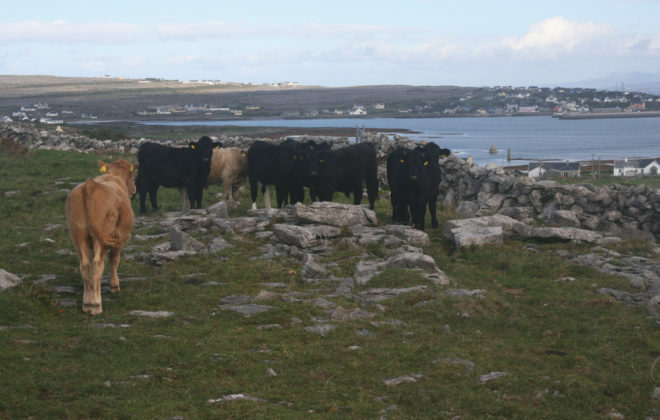 Most people were under the impression that cattle got to live on grass their whole lives and the Herberts explained the grass-finished difference. 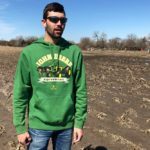 Now there is such a popular demand for grass-finished beef that people are surprised the end product isn’t commonly found at the grocery store or a restaurant. Another key to the quality of Trail’s End beef lies in the low-stress way the animals are handled throughout their lives. The loading and sorting system Tyler designed and built for their animals displays the hallmark curves and solid walls of Temple Grandin’s low-stress handling research. There’s enough room to get among them on horseback, another quiet way to work cows. And Trail’s End cattle ARE handled more than most. Because the home quarter (purchased by the couple and financed through Tyler’s off-farm job in Alberta’s oil patch) and the summer pasture are 20 km apart, their cattle get used to being trailered. Tyler comments when the cattle take that last trip to Coaldale to the butcher, it is just another familiar ride in their own trailer. 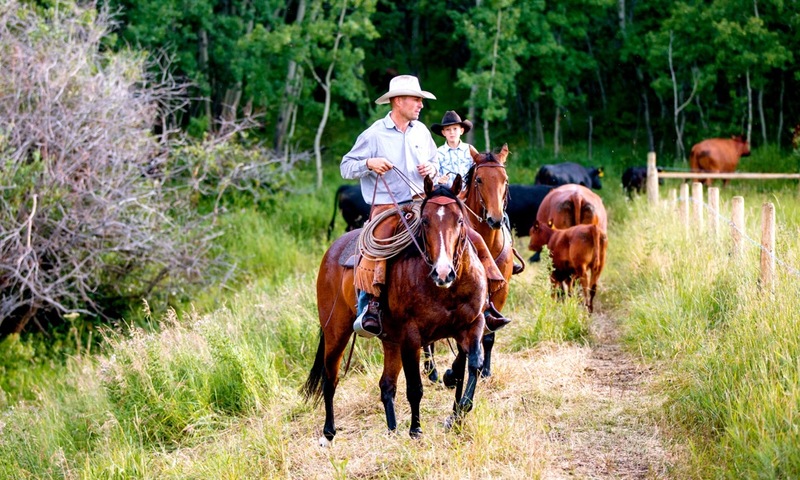 From a small herd of 20, the Herberts have grown their business in sync with customer demand to 60 of their own cattle, plus an additional 40 head that they slaughter for the A7 Ranche (another heritage ranching operation) and butcher as Trail’s End Beef. The beef sells out every year. It’s quite an accomplishment considering they are marketing their cattle in wholesale lots: quarter, sides and whole carcasses, to mainly urban customers. 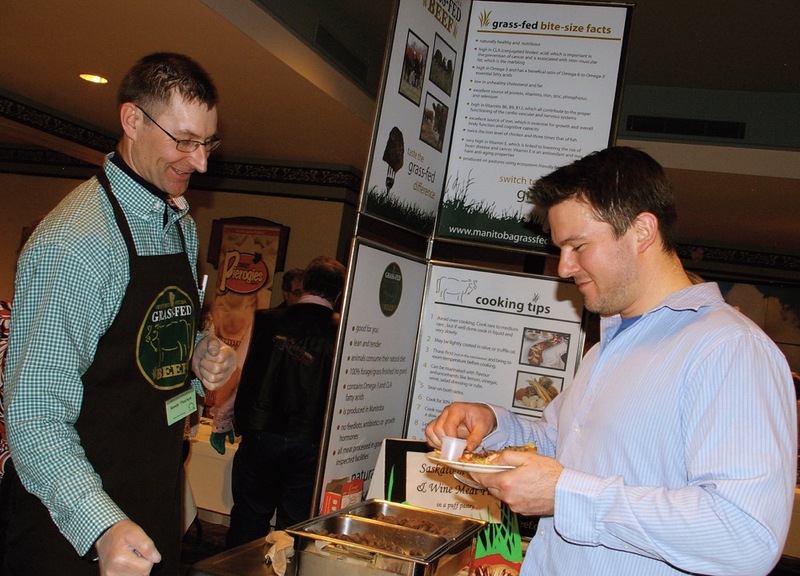 Whether you call it “pasture to plate” or “farm gate to plate,” sustaining a direct-selling model adds another layer to the business of farming. Trail’s End adeptly uses electronic and social media to leverage its business assets. The backbone is meticulous record-keeping: treatment records, pasture records, calving records, butchering records, customer records. Rachel characterizes this record-keeping as computer ranching, and she will often use that hashtag when she Instagrams photos from their operations. She flat out says their business would not be possible without it. Tyler uses a pocket journal to note calf birth dates and tag numbers. As well as CCIA tags, the Herberts also tag each calf with a year letter (like purebred breeders) so that they can easily identify the year of birth. This is a particularly important piece of record-keeping because these animals go to slaughter a year later than most. 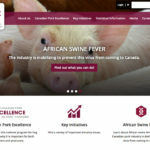 Meat inspectors will sometimes question the age of the carcass, in keeping with Agriculture Canada’s 30-month slaughtering cut-off, instituted during the BSE crisis. An age-verified birth certificate accompanies each animal to the butcher. Trail’s End has had a website from the get-go and has recently revamped it. It is the key customer point of contact, and Rachel has made sure the online order form is simple and easy to use. 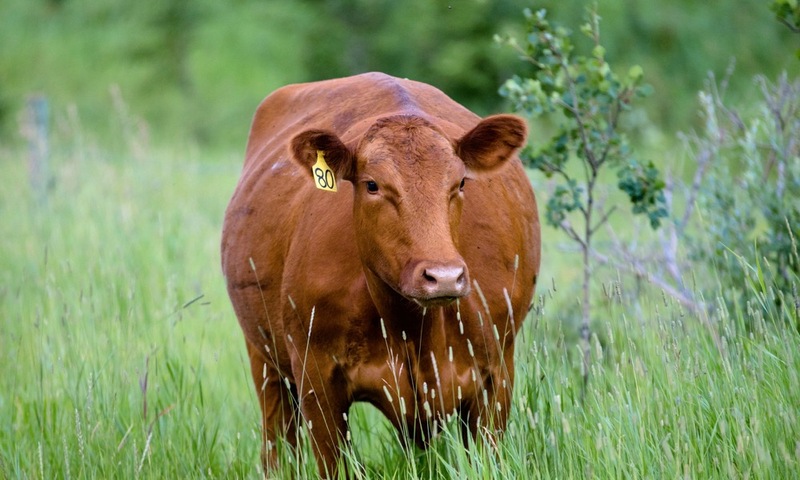 Crucial in the Trail’s End Beef story is the holistic, sustainable way the cattle are raised. The Herberts also bring orders into the city of Calgary so it is convenient for their customers to pick them up. Trail’s End has an active Instagram account, where the Herberts are able to share Tyler’s great shots of their operation. 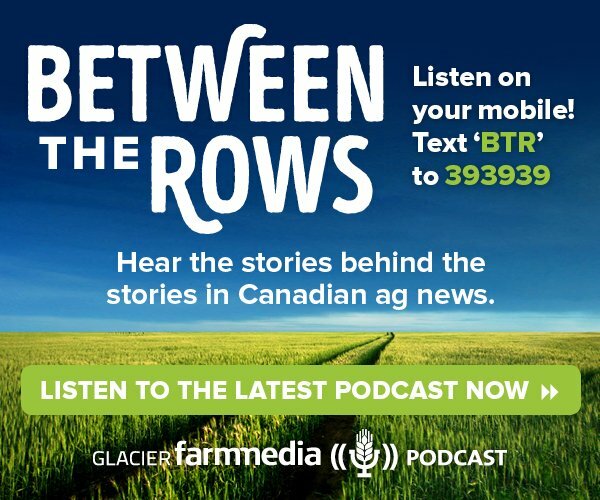 Even in the winter, after their hectic June-September marketing season, Rachel will post beef recipes on the website to keep Trail’s End customers engaged, also sending out a customer newsletter and blog. The couple have participated in Alberta Agriculture’s Open Farm Days since its inception. 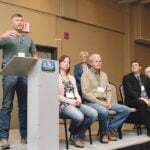 Both credit the opportunity to open the door on their ranching lifestyle to urban Albertans as another building block in their success, especially as they started their direct farm sales. So important is that open-door atmosphere that the Herberts built a galley kitchen in their new barn where they host visitors. The barn displays Tyler’s handiness and inventiveness. A tack room inset rotates 360 degrees, allowing saddles and tack to be displayed in the lounge or rotated to the barn side when they are using their horses. 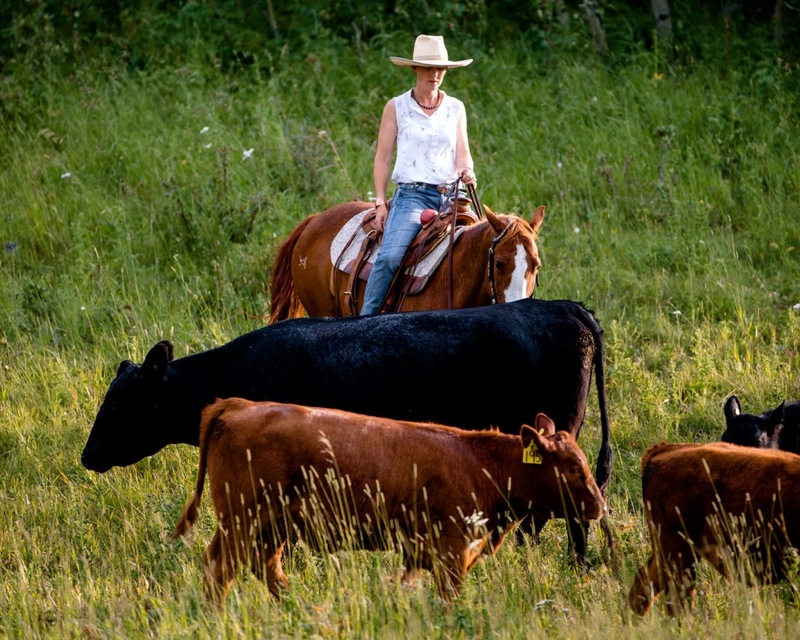 Crucial in the Trail’s End Beef story is the holistic, sustainable way the cattle are raised. They are outside all year long with room to roam, fed a forage-based diet their entire lives and have access to clean water. To add another layer of transparency to their business, and define what grass-fed actually means in practice, Rachel and Tyler Herbert applied to be certified by A Greener World, an American-based third-party auditor that individually certifies operations for animal welfare practices. Trail’s End has received two stages of certification: first for their animal welfare practices and second, for grass-fed beef. Being certified verifies Trail’s End is raising their animals according to high welfare standards. 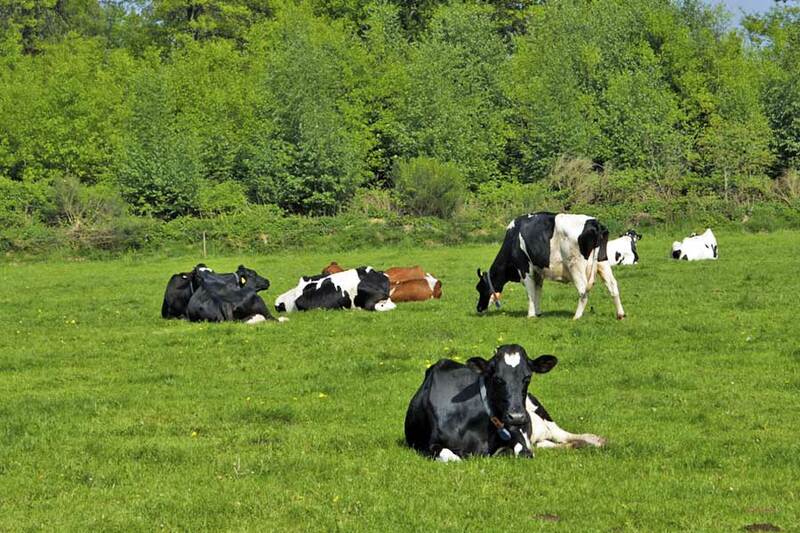 The label is the first — and only — food label in North America to guarantee food products come from animals fed a 100 per cent grass and forage diet, and raised entirely outdoors on pasture or range. Gentle handling and a focus on sustainability are backed up at every step with thorough electronic record-keeping. 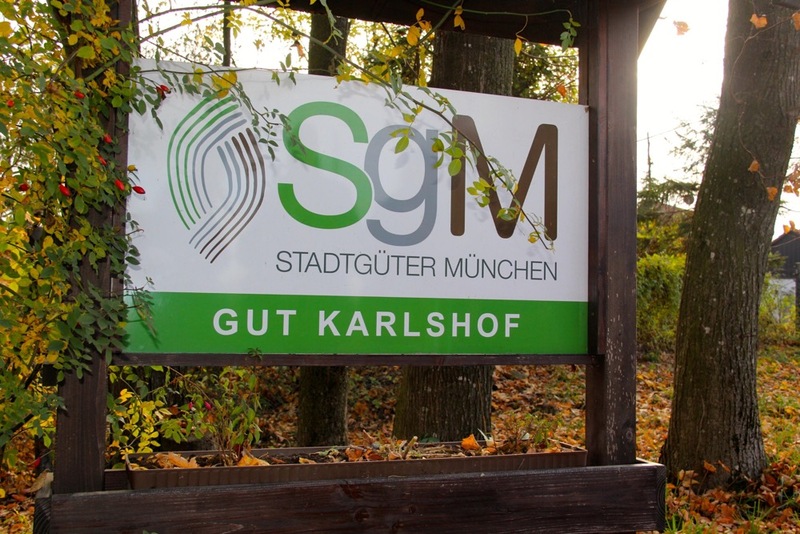 Rachel says the AGW certification is an interesting tool. Even their abattoir took the step of being certified by AGW. 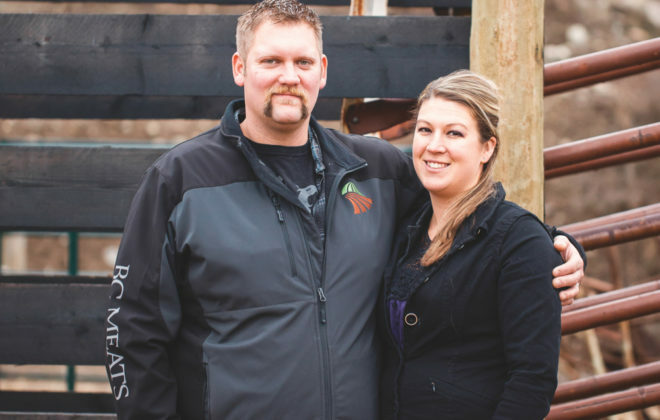 Prairie Meats in Coaldale, Alta., has processed the Trail’s End cattle since Tyler and Rachel Herbert expanded their venture. The Herberts view the relationship as a business partnership, and Prairie Meats owner Jennifer Anderson agrees. “If we make their customers happy, then we make them happy,” Anderson says. Trail’s End is not their only direct-to-market customer. She says segregating each animal and ensuring its meat gets to the right customer is just standard practice for them. 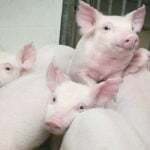 As a small abattoir, they pride themselves on quality control and their ability to trace the processed meat to the animal and farm it came from. They use the Herberts’ tagging system to issue a number to each animal as it arrives. As well, the Herberts receive a sample of meat from each carcass they process. If there are concerns with a customer’s order, that sample allows it to be matched to the animal and, if need be, sent for DNA testing. Again, this meticulous record-keeping from both parties allows for transparency and quality control. The beef Tyler and Rachel raise weigh as much as 1,500 pounds on the hoof when they are ready to go to market and can dress out as high as 900 pounds on the rail, though they estimate the average is 850. Because the cattle are direct marketed, they are not graded but Rachel says they would be AAA or AA if they were. 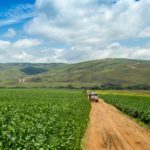 Will value adding on the farm work for you?